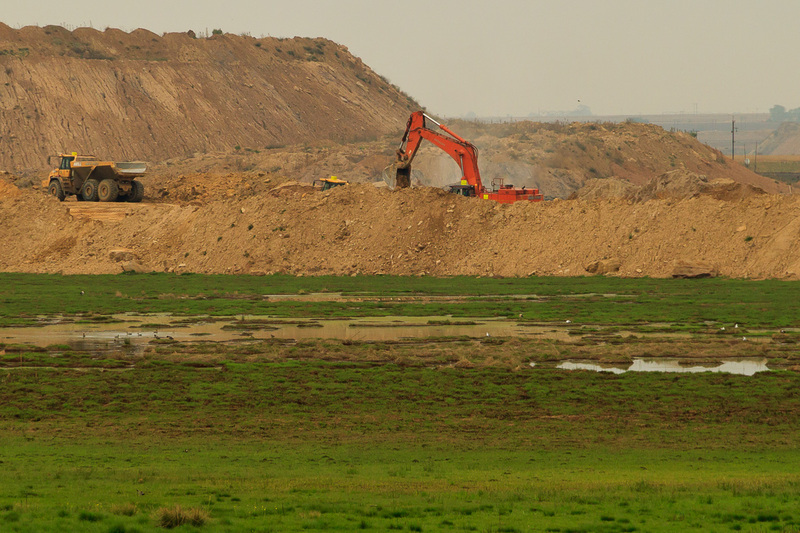 Exxaro Leeuwpan Colliery is expanding, threatening national water and food security by destroying wetlands and pans, and disrupting river flows. Activists claim that their advance into the Weltevreden Pan is illegal. The Leeuwpan Colliery is located on the Mpumalanga Highveld, less than five kilometres from the town of Delmas, South Africa, approximately 65 kilometres East of Johannesburg. The Highveld is rich in coal reserves and numerous coal mining companies are exploiting these reserves. This region has some of South Africa’s most productive arable land, and is of strategic importance for South Africa’s national food and water security. The farm Weltevreden forms part of the Leeuwpan operation and Exxaro has obtained a valid mining right for this farm. They did not however secure a Water License for this property, which makes mining on the farm illegal. The conflict started early in 2012, when a local farmer laid charges against Exxaro for mining illegally in a wetland referred to as the Weltevreden Pan, on the farm Weltevreden (Afrikaans for very satisfied). The Department of Water Affairs responded with a stop order, and various analyses of the case have been published in national media and NPO websites. Project Details Extraction is taking place at a rate of 3 million tonnes of coal per annum at Leeuwpan Colliery. Leeuwpan has a coal reserve base of about 143Mt and a resource of about 160Mt. Why? Explain briefly. Once the Water Tribunal is reinstated, the directive issued by the Department of Water Affairs will again become valid. The outcome remains uncertain until that time. National Environmental Management Act (NEMA): The Minister of Water Affairs has been negligent in not reappointing members of the Water Tribunal. Exxaro used this situation in legal manoeuvrings to disempower legal enforcement agencies that tried to stop them on the Weltevreden farm. Exxaros compliance with a request for information under the Promotion of Access to Information Act (PAIA) was incomplete, but adequate to verify concerns. Exxaro has shown gross non-compliance with the National Water Act (NWA). They are mining on the Weltevreden Farm without a water license. Specifically they are in violation of NWA regulations by practicing opencast activities inside the pan/wetland. Report on Leeuwpan by Elise Tempelhoff of Beeld. Mining Weekly’s article on Leeuwpan’s Profile 2007.